There are good weeds and bad weeds. Good weeds provide ground cover and protect the soil from excessive wind and water erosion and heat. However, bad weeds take away precious moisture and nutrients from your crop and can down grade it due to contamination. If it’s a bad weed, the challenge is then what sort of herbicide do I use? Most herbicides have varying levels of side effects on the environment, the person applying it and the crop you are wanting to protect. It’s good to know that at OCP we have developed a NEW herbicide which is safe for the environment, the applicator and non-target crops when used as directed. 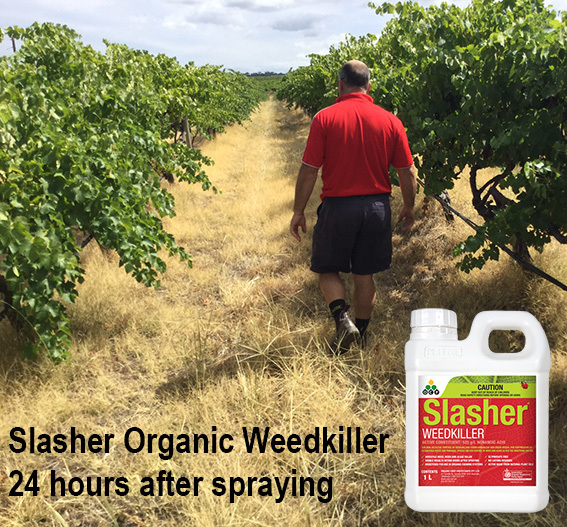 SLASHER ORGANIC WEEDKILLER contains 525g/L PELARGONIC ACID which occurs naturally in plants under certain environmental conditions . 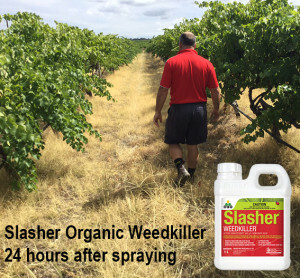 SLASHER ORGANIC WEEDKILLER is the first Organically Registered Pelargonic acid based “burn-down” herbicide developed and manufactured in Australia by OCP. Independant trials have validated that SLASHER ORGANIC WEEDKILLER is considerably more cost effective than the standard Organic weedkillers. It can be used where other herbicide sprays pose a potential risk to public health and safety; can drift long distances onto sensitive plants causing irreversible effects, and where lasting soil residues can be taken up by surrounding plants and cause long term physiological damage.